About a year ago I came across the work of the historian and archaeologist Ian Morris, who observed that “change is caused by lazy, greedy, frightened people looking for easier, more profitable, and safer ways of doing things”. This Morris Theorem essentially presents human sloth, greed, and fear as the key drivers for our society’s appetite for change – change of our environment to our own benefit. That is what we call innovation: the purpose is an easier, richer, safer life for all of us. While only a few of these policies are actually tailored specifically to innovation, they collectively define a society’s innovation fitness: the agility to respond to the unforeseen as well as the resilience to adapt to the unavoidable. The multitude of policies that influence the innovation capacity and success of a society form a network of complex interactions that make innovation policy a difficult and even opaque field of study. Rather than trying to dissect the individual building blocks of this network, I’d suggest to take a fresh look at the appropriate objectives for policies to ensure a society’s innovation fitness. To that end, I’ll view innovation policy through the lens of the innovation landscape I’ve sketched earlier. A conventional approach to innovation policy, i.e., a society’s set of policies that have the potential to influence innovation, will usually cover a significant part of the landscape. The intended effects will be focused on the first quadrant (business as usual). That’s where the economy, where business generates most innovation. Policies will furthermore stretch into the second quadrant (research) to promote the generation of novel ideas as essential building blocks for novel solutions. 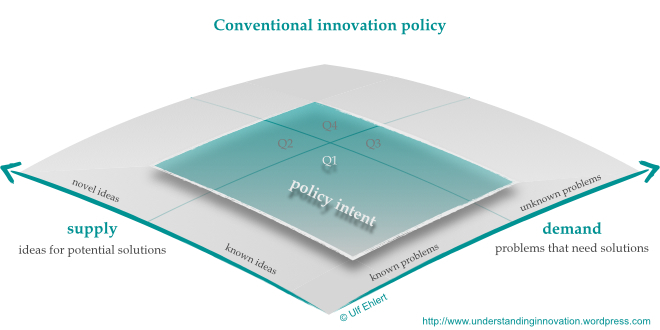 And policies will also strive to enable some innovation in the third quadrant (disruptive) to explore and expand the limits of the established rules. As a side effect, these policies may support some innovation in the fourth quadrant (wicked), but that will be a collateral benefit rather than the principal intent. That said, conventional innovation policy will likely leave wide areas of the innovation landscape uncovered, especially in its margins. However, for a society to be fit for innovation, I’d argue that its innovation policy must cover the entire landscape: no society can afford to leave problems unaddressed or ideas unused. Or just leave it to chance whether problems are solved or ideas exploited. In addition, I’d suggest that innovation policy must be innovative itself: it cannot stay unchanged, because the innovation landscape itself is not static. The landscape moves forward and outward as novel ideas emerge and novel problems arise. Therefore, an innovation policy that is fit for purpose must adapt over time; it must evolve in response to and even anticipation of changes in the environment. For a society to adopt a truly comprehensive innovation policy, I can see two broad areas that deserve specific attention, one looking forward, one looking backward. Forward looking innovation policy will naturally focus on novelty, on the supply of novel ideas as well as the emergence of novel problems. Less intuitive, but at least equally important is backward looking innovation policy, focusing on what was novel in some distant past, what has become known supply and known demand, and what might present a hindrance to future innovation. These are two ideas that I’ll attempt to develop in more detail in upcoming posts. So stay tuned.